Looking for an Apple TV converter? Want to make the best of your Apple TV? You don't have to buy all your videos over again from iTunes – just use Movavi Video Converter to adapt your videos and DVDs to an Apple TV-friendly format. 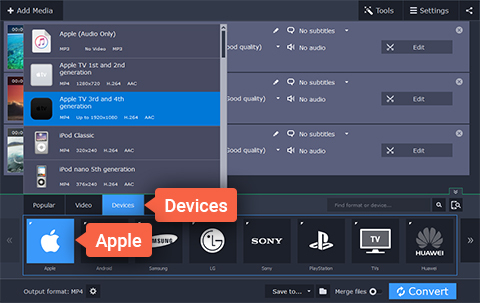 Run the converter, open the video you want to watch on Apple TV, select an appropriate ready-made preset and click Convert. Here are the easy steps. Just download the necessary version of the program and follow them. 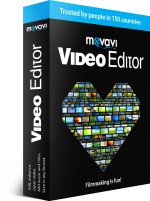 Download Movavi Video Converter and run the installation file. Follow the on-screen instructions. 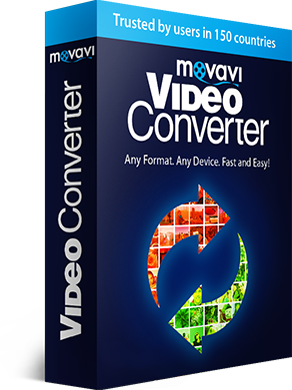 Run Movavi Video Converter. Click the Add Media button and then Add Video to select videos for conversion. 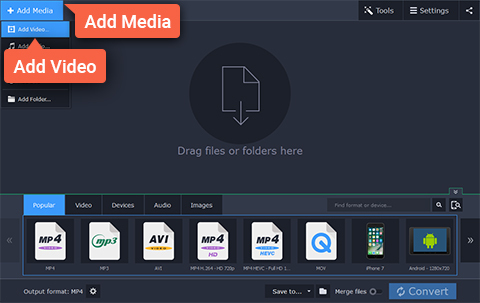 You can convert AVI, MOV, WMV, and most other video formats for viewing on Apple TV. If the original video source is a DVD, click the Add DVD button and choose Open DVD. In the lower part of the program window, go to Devices, choose the Apple category, and select the appropriate Apple TV preset from the list. Click the Folder icon next to the Save to field to specify the folder in which to save the converted video files. To transfer converted files to iTunes automatically, just click the Share button and check the iTunes box. Finally, click Convert. Converting a video has never been so easy! Attach your Apple TV to the computer and sync it with iTunes. Wait for a minute while iTunes recognizes the device. If you selected the iTunes checkbox before starting conversion, the Apple TV library will be updated automatically. Copy the converted video files to the device. It couldn't be easier to convert videos in any format for watching on your Apple TV! IMPORTANT: To export movies from Movavi Video Converter to your Apple TV, we highly recommend that you have iTunes 6.0 or later installed on your computer. You can use the Apple Software Update application to update iTunes.